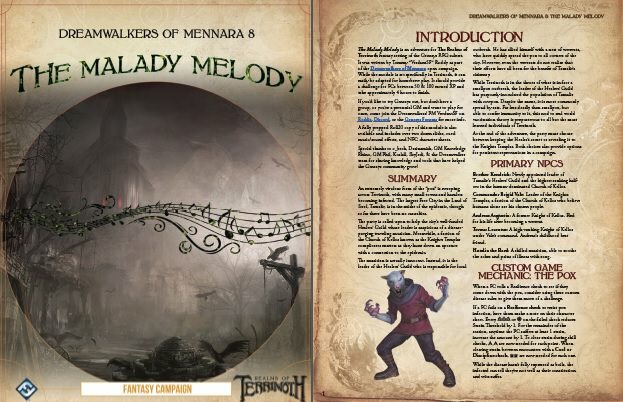 Per instructions to create a thread for inclusion on the Genesys Resource List, I present The Malady Melody, an adventure module for Realms of Terrinoth. I haven't had a good look at it yet but if the content is as high level as the production value, this will be a really awesome adventure! Yay! Somebody finally posted an adventure module. (I'm working on a couple myself.) Thank you for sharing, and to everyone else, more adventures please, for this or other settings! How was this generated? It looks even better than the GM-Binder stuff. Adobe InDesign with assets shared by Drainsmith on the FFG Discord channel :). Sadly my version of InDesign doesn't work with what I've seen other creators develop.